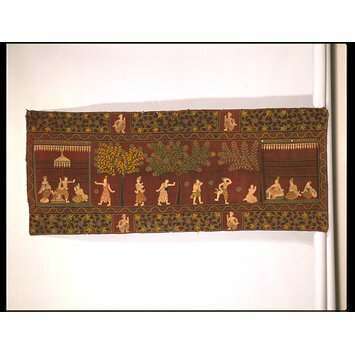 This fine kalaga (pictorial textile hanging) with a notably restrained use of ornamentation was obtained by the donor, a British architect working in Burma in the late 19th and early 20th centuries. It would have been used either as a decorative wall hanging, a room partition, or as an outdoor screen on festive occasions. Britain's control of Burma extended as the 19th century progressed, and the country was annexed in 1885. The extravagant style of kalagas appealed to Burmese and Europeans alike and their popularity soared in the middle of the 19th century. 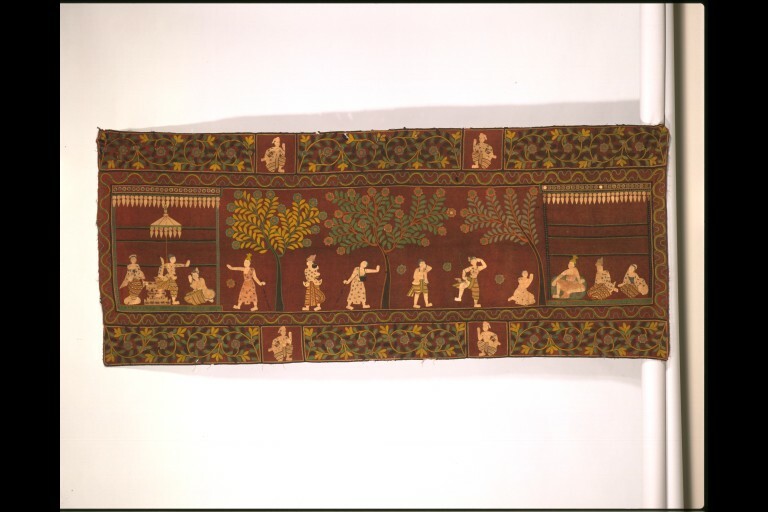 This hanging, illustrating scenes from either Burmese legend or one of the Jataka stories, which recount episodes of the Buddha's former lives, is made of stitch-work and appliqué of partly painted coloured textiles on a red wool ground. 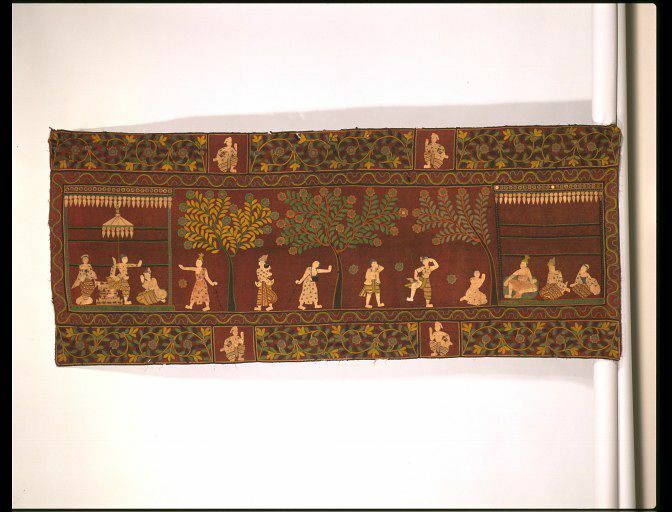 The costumes of the figures are depicted in the stylised tradition of Burmese theatre relate to the fashions worn in the Mandalay Court of about 1880. Kalaga or hanging in red wool with stitch-work and appliquéd with coloured felt, partly painted, wool, cotton, braids and sequins. Red ground with the central design framed within borders of leafy and floral arabesques interspersed with four panels of dancing male figures and acheik textile patterns. Beginning from the left: Within a pavilion which is decorated with a row of crystal drops and a royal umbrella, a prince, armed with a dha (sword), descends from his throne and confronts a hermit who is approaching the chamber. They are watched by his lady and attendant; Within a parkland setting of flowers and three flowering trees are a well dressed young man and an acolyte with a stick in his hand. Beyond them are two male figures, one of them is holding a kyein-setkya (magic wand with a flame-like ornament) indicating that he is a spirit; At the end of the panel, a hermit and a couple sit, the acolyte is bowing to him. The subject matter (which is unidentified) is from a Jataka story or taken from Burmese legend. Kalaga obtained by the donor while he was working in Burma as an architect in the late 19th or early 20th century.